ICP is a diagnosis of exclusion, meaning that other causes of impaired liver function and cholestasis, such as viral hepatitis, biliary obstructions or strictures, or autoimmune hepatitis, among others, must be ruled out before the diagnosis can be made. Regardless of the reason for elevated bile acids, however, the treatment to reduce the risks to the pregnancy should be followed. Currently the most sensitive test available to detect Intrahepatic Cholestasis of Pregnancy is the serum bile acid test, a blood test to measure the level of bile acids. It is often referred to as total bile acids, bile salts, or bile acid salts. Research suggests that elevated bile acids may be linked to risks to the unborn baby. One large study of a Swedish population found that bile acids over 40 µmol/L pose a greater risk of preterm labor, respiratory issues, and meconium staining. Other studies in the same area have also found a correlation between higher bile acid levels and respiratory issues. A large study of an American population found that moderate Intrahepatic Cholestasis of Pregnancy (defined for the purposes of the study as bile acids of 20-40 µmol/L) was at the same risk of fetal complications as severe Intrahepatic Cholestasis of Pregnancy (over 40 µmol/L), but that the rates of complications for both groups were very small with treatment. Bile acids over 10 µmol/L indicate ICP. Many doctors will not diagnose without elevated bile acids, but some doctors and specialists may diagnose based upon symptoms consistent with the disorder or elevated liver functions alone. Some doctors who are not specialists may not be familiar with the bile acid test, so it may be necessary to request it by name. 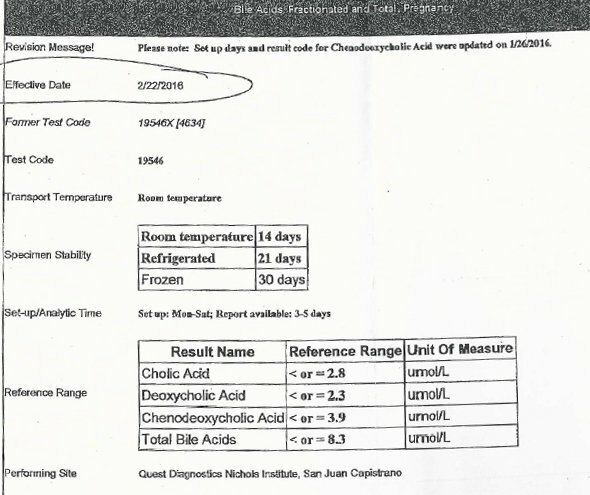 In most cases it will take 5-10 days to receive results of the bile acid test since it is processed in only a few specialty labs and must be sent out. This should be taken into consideration in cases where you have developed Intrahepatic Cholestasis of Pregnancy late in your pregnancy. Bile acids are not thought to be the cause of itching in Intrahepatic Cholestasis of Pregnancy. It has been well-documented that bile acid levels do not correlate well with the intensity of itching a person experiences. Itching does correlate well with the level of another chemical that is elevated during ICP but can’t be tested for in the typical lab setting (this chemical is known as LPA, or lysophosphatidic acid). Because of this, it is possible for bile acids to be normal for weeks or even months after itching begins. If your initial tests appear normal, but you continue to experience symptoms, you should be retested every week or two weeks as long as symptoms persist. View Quest Laboratories reference ranges for Total Bile Acid blood test. Approximately 60% of women with Intrahepatic Cholestasis of Pregnancy will have elevated liver functions during their pregnancies. A normal liver function panel does not rule out the disorder, however, the test results return within hours instead of days, which can provide your doctor with information more promptly. When liver functions are elevated they may be elevated prior to elevated bile acids, after elevated bile acids, or at the same time. There are many items analyzed in this set of tests. The following are important to note regarding Intrahepatic Cholestasis of Pregnancy. ALT (Alanine Aminotransferase) is the most sensitive of the liver functions for aiding in the diagnosis of Intrahepatic Cholestasis of Pregnancy, followed by AST (Aspartate Aminotransferase). Elevation of either or both of these may indicate that you have ICP. Some doctors will diagnose based solely upon elevation of these liver enzymes, both of which are produced when liver cells are damaged. Elevation of ALP/ALK (alkaline phosphatase) alone does not provide an indication of Intrahepatic Cholestasis of Pregnancy. This liver enzyme is less specific to the liver, and is a by-product of bone formation as well as produced by the placenta. It is normal to have elevation of this enzyme during any pregnancy. Bilirubin is elevated in a small minority of cases (estimated to be less than 10%). Elevated bilirubin may also lead to jaundice. When bilirubin is elevated it is generally only mildly elevated. Other tests included in a liver function or complete metabolic panel are not specific to Intrahepatic Cholestasis of Pregnancy, but if they are abnormal discuss with your doctor what this may indicate. 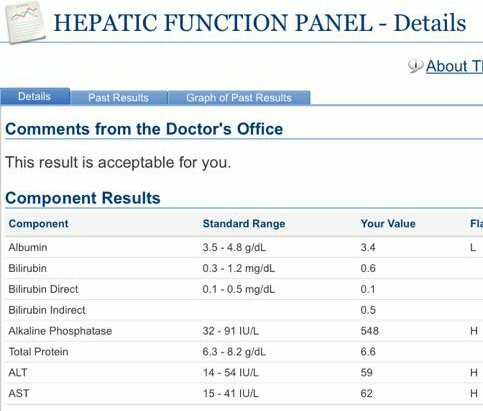 View an example of results and reference ranges for a Liver Function blood test. Since Intrahepatic Cholestasis of Pregnancy is a rare disease (in the United States a rare disease is one defined as affecting less than 200,000 Americans at any given time, whereas ICP is estimated to affect approximately 6,000 Americans per year), some doctors may not have a working knowledge of the disease. Your doctor may not know of the disease, and if he or she does, may not know much about it or may even have misconceptions regarding the condition. At one time Intrahepatic Cholestasis of Pregnancy was considered a benign condition, meaning that it does not pose a risk to the baby, and some may still regard it as such. You may need to take educational materials with you to your appointment to help your doctor learn more (educational brochures and provider information). Print these materials and share them with your doctor rather than mentioning that you found the information on the internet. Given that it is so uncommon, your doctor may not be convinced at first that you may have the disorder. Be prepared for skepticism and understand that as long as your doctor is willing to run the proper tests it is not important. If your doctor is resistant to learning more about the condition or if he or she is unwilling to run the test for bile acids then it may be time to seek a second opinion.